Capri tapestry shows a lovely view of the coast of this island in Naples. The blue waters of the Gulf of Naples is seen here in this vista, where we walk along a cobblestone path decorated with urns of flowers and poplar trees. A gazebo with flowers is seen in the vantage point, as we look out onto the distant hilly island contours. 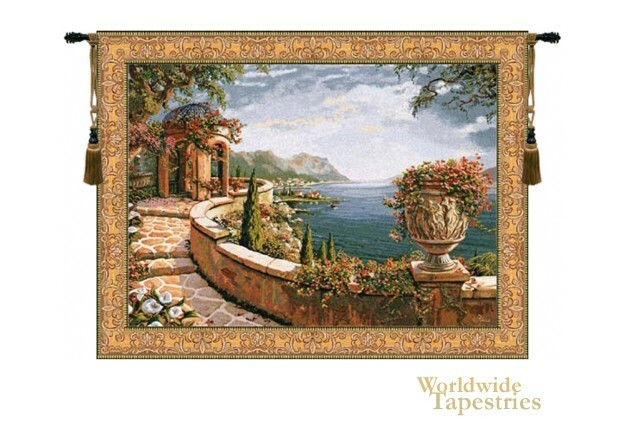 This landscape tapestry "Capri" is backed with a lining and has a tunnel for easy hanging. Note: tapestry rod and tassels, where pictured, is not included in the price. Dimensions: W 46" x H 34"
Dimensions: W 55" x H 42"